Ozu's earliest surviving film, from 1929, follows students Watanabe and Yamamoto as they unknowingly compete for the affections of the same girl. With exams looming, Takahashi finds a creative way to avoid doing his revision in this roguish comedy reminiscent of Harold Lloyd's The Freshman. Graduate Okajima finds that his impressive beard, worn in traditional style, makes it impossible to find a decent job or make a good impression. Ozu's cheerful comedy focuses on the tension between tradition and modernity, a theme he revisited in some of his most profound post-war work. Hirano and his friends are happily enjoying a carefree college life, but when tragedy strikes everything changes. Scripted by Ozu's long-term collaborator Kogo Noda, this film subtly moves from light to dark and questions the durability of friendship. 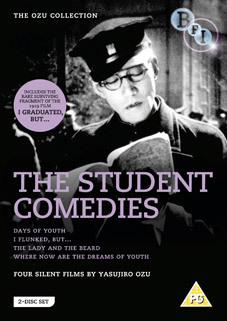 The Student Comedies will be released as a 2-disc DVD by the BFI as part of their ongoing The Ozu Collection on 20th February 2012 at the RRP of £29.99. 38-page illustrated booklet with newly commissioned essays from Asian cinema experts Tony Rayns and Alexander Jacoby.